On January 31st 1888, in Torino, Italy, a priest named "Don Bosco" who had a charismatic presence at that time, left this world. The educational work which he started became of a universal scale today and has spread to more than 100 countries in the world The "Preventive Education" draws attention inside and outside the Church, and gives many suggestions to mission schools and Japanese educational world. And today, those who have succeeded and maintain his spirit are the "Salesian Society" and the "Salesian Familiy". In 1926, these educational groups have sent to Japan Father Cimatti so- called "Don Bosco of Japan". "Don Bosco",( properly named "Saint Giovanni Bosco") who is called by the Catholic Church "Father of the youth, The Mentor of Catholic Education" was born on August 16th 1815, in a poor farming family in the village of Becchi, near the city of Castelneovo in the region of Piemonte in northern Italy. It was after Napoleon, when the political situation was unstable and the Church was confronted with the government in the unification of Italy. The labor movement grew more intense because of the Industrial Revolution. It was at the end of the 19th century that Japan quit the national isolation policy, and with the Meiji Imperial Restoration, and wanted to stand shoulder to shoulder with the western world. Japan was pushing forward a plan of industrialization and modernization and was putting emphasis on national education. The Catholic missionary movement has come back to Japan. And it was also the time for the Church to start to devote its energy to education. Timely, Don Bosco opened a new path for education. It is said that his activities began on December 8th 1841. On that day, being a new priest, Don Bosco met the first poor boy. In those days many boys left their farm and went to big cities to find jobs. Don Bosco found them hanging around, committing crimes with their face clouded. In the central market, there was a "market of young workers". People from building sites and factory owners used to employ boys, forcing them to work 12 to16 hours a day for a half Lira. It was said that the life expectancy of the workers in Torino was about 19 years old. This was indeed the consequence brought about by the "Industrial Revolution". Subsequently, several years later, communist movement started. Don Bosco even visited prison. He wrote, "I was terrified to see many healthy talented boys, aged 12 to 18, doing nothing, bitten by lice and fleas, without physical and spiritual food." He made up his mind to devote his life to save these boys. He started a new style of educational work called "Oratorio" At the beginning, there was no fixed place. However, within a year, several hundreds of students came to gather up, attracted by Don Bosco. He himself became a pillar for the boys. The place he borrowed, became a playground, a night school and a place to make friends and to pray. But these gatherings were looked at cold-heartedly by the neighborhoods and Don Bosco had to move from place to place during 5 years. The municipal authorities and even some people inside the church looked at him as dangerous. In 1846, he acquired at last a humble barn. This became the birthplace of the world-wide activities. 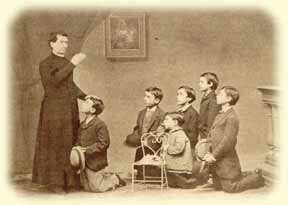 With the help of volunteers, a dormitory, a school for vocational education and a school of general course were established at "Oratorio"
To develop this activity, Don Bosco created a religious organization called "Salesian Society" His students became the first members and collaborators. The name of the organization was "Society of Saint Francis of Sales" It was so called because this Saint was cheerful and warmhearted. In 1874, the Church has officially recognized this society. The way of education Don Bosco adopted from the beginning was named "Preventive Education" and it became the educational concept of the Salesian Society. 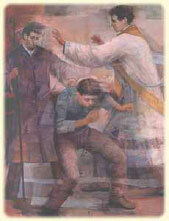 Don Bosco's work called forth big echo among the people of those days. There were requests from many foreign countries for establishing similar organization. For this reason, with the help of God and kindness of people, he himself appealed energetically for help to people. 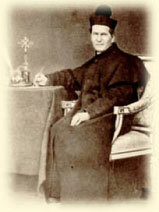 In February, 1883, Don Bosco was not in good health, but he traveled all around France.and stayed in Paris for four weeks. Even Victor Hugo, author of the great novel "Les Miserables", visited Don Bosco. The newspaper "Le Figaro" wrote that "In front of the house where Don Bosco stayed, coaches lined up all day during a week." When he preached at La Madeleine, although he could not speak French well, the church was overflowed with people. Newspapers wrote that "even a king would not be so warmly welcomed" If you see a picture of those days, you will see him very tired in his face but he attracted many people,as does Mother Teresa today. Yet, being modest, he said to Father Rua, in the train on the way back; "Father Rua, do you remember? the small house in Becchi. I lived in that poor house with my mother. We were farmers with only a small field and two cows. If the leading figures of Paris knew that they welcomed such a farmer from a village, what will they think?" One politician said,"If he was not a priest but a politician, a scholar or an enterpriser, he would have been exceptionally outstanding, not only in Italy but also in whole Europe. But he was lucky he was a priest, because he is still "someone of the present time", not "someone of the past". On January 31st1888, he went to heaven when he was 72 years old. The Church admitted the great educater's high virtue and praised him as "Saint Giovanni Bosco" "Father of the youth, the Mentor of Catholic Education." Three years before he died, in 1885, he had a dream. The future of his work was shown in it: As he traveled around the world, many countries, peoples and towns came upon the scene. South America, Africa, Australia, Persia, India, China etc. And after Beijin," a high mountain facing a wide sea. The name of the town was . Children were playing in a big playground",it was said. A person who heard about the dream from Don Bosco, wrote "Don Bosco becomes old and his memory is depreciated. For example, he made a mistake in the name of the city: he said "Meaco" instead of "Macao". However, the one who made the mistake was the writer himself. Meaco was correct. Because, in Macao there is no high mountain facing a sea. Don Bosco who became later an honorary member of the geography society of France, certainly saw Japan, then. In 1885, Japan already drew attention of countries of Europe and America. In 1862, 26 Japanese saints were canonized. In 1867, in Nagasaki, several descendants of Kirishitans were found. In 1848, Don Bosco wrote "the History of the Church" in which he wrote many pages about Kirishitans in Japan. He also wrote about the persecution of Kirishitans like, "Taikosama" or "Takayama Ukon". The source of article must be "the History of Asian mission" written by a member of Societa di Gesu-Bartori, published in Torino in 1825. The chapter of Japan.is made of 5 thick volumes. In 1867, when 204 martyrs were named disciples of God in Rome, Don Bosco himself could not participate, so he sent two of the members of the Society. In revised edition of" the History of the Church" which was published in 1870, he wrote a short biography of each of the 26 saints. There, the name "Meako" appears more than 10 times. It meant "Miyako" or "the Capital" at the time of the Kirishitans. In the books of those days, the name "Meako" was used. It is certain that Don Bosco was interested in Japan and he saw in a dream the future of the Salesian Society in Japan. Now this dream has come true and there are many activities of the Salesian Society in Japan. "the Biography of Don Bosco" is published in many countries of the world and there are more than 1000 different versions. Moreover, publications telling directly about his spiritual life and his way of education number about 30000. The best book we can find in Japanese is "Saint Don Bosco" written by Ofre Unfortunately, "the new biography of Don Bosco" by Teregio Bosco, very popular overseas, has not yet been translated into Japanese. You must read this book. The exact title is "Memorie dell'Oratorio di S. Francesco di Sales from 1815 to 1855" Don Bosco started to write it by the order of Pope Pio IX at the age of 58. It is a story book about his first 40 years. However this book was not published for many years and was left untouched in a storage place of Salesian Society for 73 years. It was because he only wrote it as his teachings for the children around him, so he has ordered not to publish it. .But in 1946, it was published as internal materials. Afterwards, it was opened to the public. As he was full of humour, he made lessons into pleasant stories. Some of the episodes are surely fun and amusing. We can imagine Don Bosco enjoying and smiling. The book contents true history but it is not a sort of photograph nor record. He added his explanation and his thoughts, in which we can always find his consideration for the education. It was for teaching and leading his children. This book was translated into Japanese in 1989. In 1983, in order to introduce the true story of Don Bosco and to put the data in order and to study them in earnest, the head of the Salesian Society in Rome had established the "Research Institute of the History of Don Bosco. August 16th. He was born in Bequi. May 11th He lost his father. His family becomes even poorer. He dreams about teaching children in future. He lives in a lodgings in Chieri. He goes to junior high and high school, working for school expenses. He studies in a Seminary in Chieri. June 5th He becomes a priest named Don Bosco. November 3rd He enters in a priest training school in Torino. December 8th He meets the first boy and starts "Oratorio". Within several months, hundreds of boys gather. They move around to find a place to settle down. April 12th He buys a humble barn. "Oratorio" becomes stable. He gets ill by overworking but escaped death by miracle. He was told to lie quietly. November 3rd He takes his mother back to Torino. May He opens a dormitory for poor boys. He creates a mutual help association for laborers. He constructs the church of Saint Francisco Salesio. He starts publishing the monthly "Letture Cattoliche". His students wish to be like Don Bosco and he elaborates a tentative plan of the Salegians, He starts a book binding school. He starts a junior high school. He establishes a school for wood workers. He talks to the Pope Pio IX about the plan of a monastery. He continues to make trips to Rome about 20 times before he dies. He formally establishes the Salesian Society. His student Mickel Rua becomes the first Salegian Priest. He establishes a school for printing. He starts a mechanical course. He makes the first school outside of Torino. in Mirabello. Subsequently, he makes many others. With only having half a Lira in his purse, he stars constructing. the Basilic of Mary help of Christians. He accomplishes the Basilic of Mary help of Christians.and he cerebrates the Contribution.Ceremony. April 13th. Salegian Society is admitted in Rome and gets under the direct control of the ,Societa di diritto Pontificio. November 11th He sends the first missionary to South America. He makes the third cooperator's group ",Cooperatori Salesiani". He writes a thesis about the education of boys and girls "Preventive Education". The first missionary group from Figlie di Maria Ausiliatrice, is sent out. Pope Leo XIII wishes Don Bosco to establish the Cathedral Sacred Heart in Rome. He makes the last trip to Rome for the cerebration of the consacrazione of Cathedral Sacred Heart. January 31st He ascends to heaven. The activities of the Salesian Society expanded to Italy, France, Spain, Argentina.Urguay and Brazil.